Here's an actual Blog entry for you. As I have mentioned previously I am about to have the LAP-Band surgery for weight loss. I have been having medical tests prior to the surgery. Last week I had an endoscopy and colonoscopy. Today I had a battery of tests including blood work, EKG and a chest X-ray. I also had a workup by a Doctor and consultation with anesthesiology. Tomorrow I have a consultation with a cardiologist. Whew! The surgery is scheduled for April 31st. Please remember me that day. So far everything has been a go for the surgery. I want to say a bit about the endoscopy and colonoscopy. 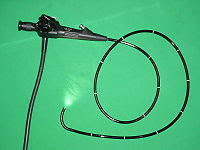 The endoscopy is a proceedure to examine the upper digestive system (esophagus, stomach and upper intestine) and is about as unpleasant a procedure as you might ever want to have. Though they give some anesthesia it is not enough to knock you out. They place a tube down your throat and look around. Not fun! The colonoscopy is a procedure that wasn't required for the LAP-Band surgery, but it was due as a regular follow-up post colon cancer. I have had that procedure many times. The prep is not pleasant since you need a thorough cleaning inside. They put you our for the test itself so you are unaware of most of it. They woke me up during the very end of the proceedure so I watched it on the monitor. I was not uncomfortable. The uncomfortablness comes later! They fill your colon with air during the test and in the following days there is a great passing of wind. Ugh! Today I started my pre-surgery diet. It is a 1000 calorie a day low fat diet. It should be easy to do. So much for the update.